Welcome to the New Year of Apples, Art, and Spirit! After two years of weekly posting, I am going to change it up a bit. Posts will still arrive on Sunday morning, but I might miss a few. 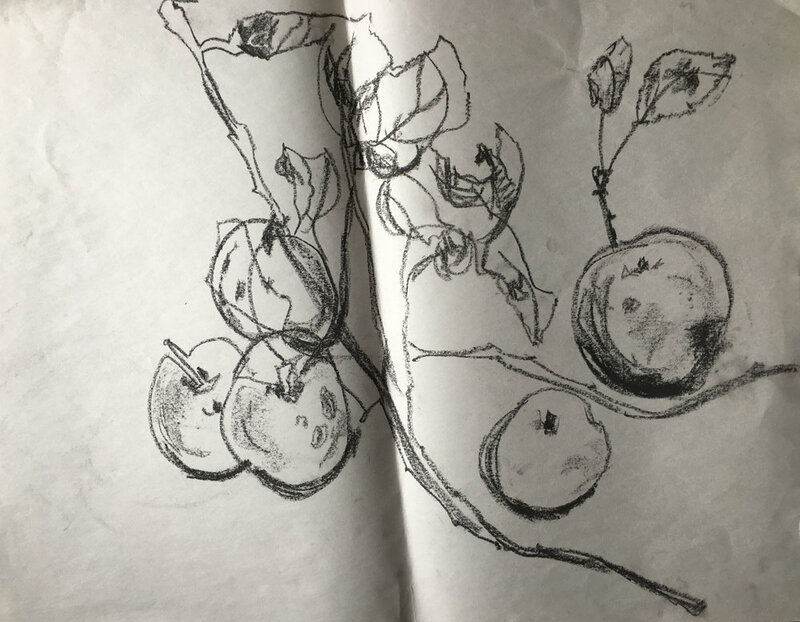 When I am not writing the blog, I will be finishing a memoir about moving to Old Frog Pond Farm — how apples came to take over so much of my life, finding a spiritual path — and lots of art. Meanwhile, the renovation of my studio has taken longer than anticipated. 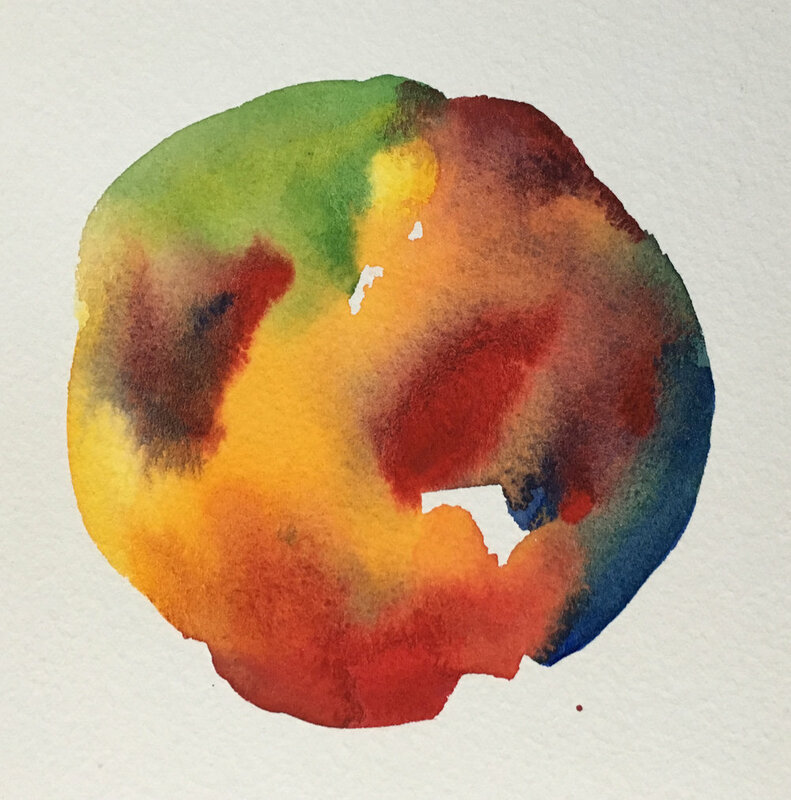 With no shop space, I’ve gone back to watercolor — a medium I find challenging and delicious. And what do I find I am drawn to paint? Apples, of course! I’ve been taking a class with Sandy Wilensky in Maynard. Sandy has us make a blind contour drawing before we start painting. Contour means following the outline of the object; blind means looking only at the object we are drawing, not at the paper. The drawings tend to be refreshingly off, the lines don’t necessarily connect, but the intense concentration of really seeing makes for a drawing with lines that are alive. It’s not about drawing our idea of what an object looks like, but drawing what the eye really sees. It’s fun and you have to trust the process. I highly recommend it, especially if, like me, you don’t feel confident about drawing. Here I’m experimenting with color, shape, and transparency. I’m also testing the medium and using the watercolor paint as if it was acrylic. Sandy’s classes are super supportive. She creates an environment where her students feel at ease. She slides in some technical information, but the focus is on finding your own expression and trusting it. 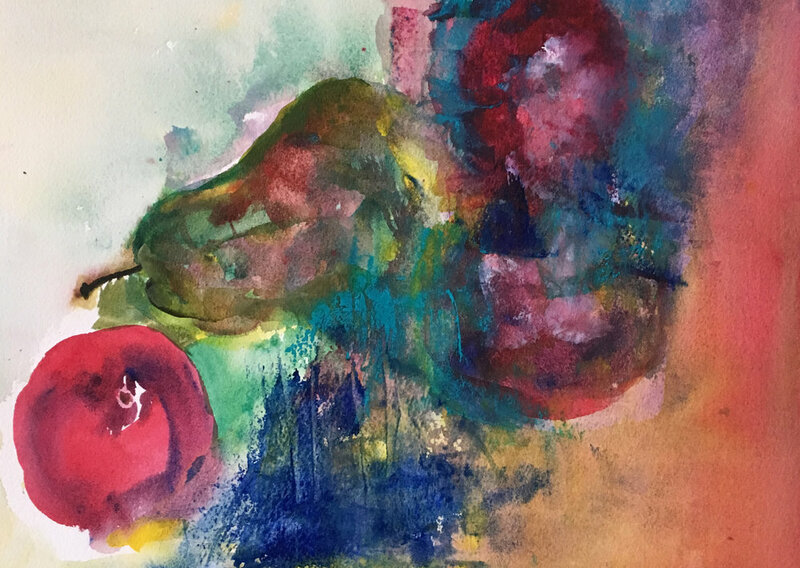 I'm also taking a workshop with Martha Wakefield, one of my favorite painters from Wild Apples days, the journal I published and edited with friends Susan Edwards Richmond, Sophie Wadsworth, and Kathryn Liebowitz. This series of Martha’s classes are all about color — we explore its technical properties — hues, tints, shades, saturation, for example. Martha gave us homework after the first session to use only one color with black and white, and paint a simple still life. I’m so undisciplined when I paint it is helpful to have these restrictions. 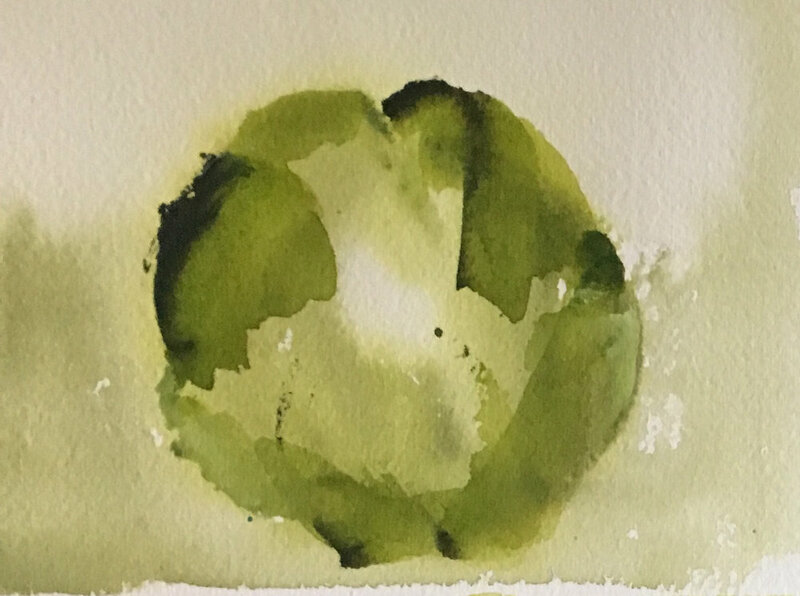 Here’s my apple using only three colors: M. Graham’s Green Gold, Chinese White, and Mars Black. Soon I will be back in my studio. It’s been lovely to explore color before I return to wood and metal. If you desire to move in a new direction with your art, or open the faucet to new creative energy in the New Year, I recommend trying a class or workshop in a new medium. Be a complete beginner, it’s humbling and freeing. And give yourself lots of space. A Zen master, Suzuki Roshi, taught: "To give your sheep or cow a large, spacious meadow is the way to control him.” Give yourself lots of space, don’t limit the possibilities; there is no right or wrong, no watcher judging, only your own mind putting up fences. Here's to freeing your muse in the New Year!